Looking to buy Microsoft Office for the best price in the land? You're in look as our comparison charts are constantly hunting for the cheapest Microsoft deals 24/7. You could buy an Office subscription from Microsoft directly, but it's often possible to get a better deal from a reliable third party retailer. In our guide below, we'll give you the best possible prices for both Microsoft Office 365 and Microsoft Office 2016. 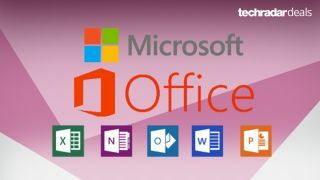 We're expecting a brand new version of Microsoft Office soon, but until then, these will be your best options for cheap Microsoft Office prices. If you're in the UK and want to install your new copy of Microsoft Office on a new machine, you might be interested in our selection of the UK's best cheap laptop deals. We also have an Australian and US selection too. If you're looking to buy Microsoft Office 365, you should know that this is a subscription-based service. The prices below are for your first year for one user to use on one PC, along with a tablet or mobile too. The advantages of using Office 365 include having access to all the latest versions of programs in the Microsoft Office suite and having 1TB of OneDrive cloud storage. The latter is particularly useful for editing documents on the go. So you could go from writing on the laptop/desktop to making a few changes or crucial last minute updates on your mobile or tablet. If the online cloud storage and device switching won't be useful, we'd recommend scrolling further down this page and consider buying Microsoft Office 2016 instead for a one off fee. If you want to get one of the best Office suites out there and not have to worry about subscription costs further down the line, we'd suggest you buy Microsoft Office 2016, also known as just Office 2016. While it does cost more than a year of Office 365, Office 2016 may work out cheaper for you in the long run. The cheapest version is usually the 'Home & Student' Edition which comes with a lifetime license for one user. And no, you don't have to be a student to buy and use this version which comes with the essential Office suite items like Word, Excel, PowerPoint and OneNote.